Winter in January can be brutal and we got a taste of that today. The news was displaying 24° this morning and the howling wind made it seem even colder. I debated staying inside and running on the treadmill until I became distracted with a home electronics project. After finishing that, I bundled up and headed outside to face the freezing cold. I knew I'd be dealing with wind chill, so I went with track pants, two top layers, plus a windproof jacket, mitten-gloves, fleece hat and the buff that KWL gave me. 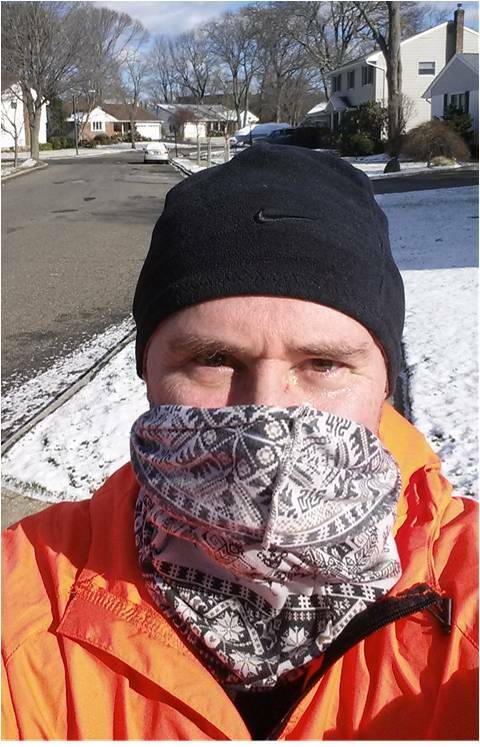 The buff turned out to be my most valuable piece of gear, protecting my face from the 14 MPH winds. No matter how hard I try, I can never get my clothes completely right. 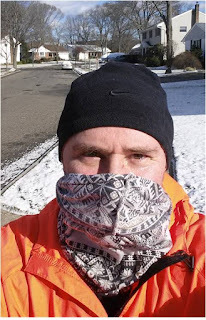 My core got fairly warm, but my extremities bordered on freezing throughout the entire run. At one point in the run, a neighbor yelled from his front porch, "Boy oh boy, this is some cold running weather!" I replied, "Grab your shoes and join me!" He laughed and wished me luck. Although the roads were clear of snow, there were patches of ice that I was careful to avoid. The wind, cold, and my freezing face tempted me to head home to the treadmill after a mile. I decided to tough it out and was glad that I did. Running a little distance yesterday should have primed me for a more energetic run today. Unfortunately I had trouble generating speed except in those cases when I was running downhill with the wind to my back. This will be another tough work week and, once again, I'll need to go into the office rather than work from home on Friday. That will impact my running schedule, but I'll try to fit in an elliptical session or treadmill run one night this week. We managed a run before I had to go to work, and he shortened it than what we usually do. I never thought I'd see that. It was COLD .. and we ran by the water in 2 different sections. BRUTAL. I'm not going to even attempt it this morning. JC cut a run short? It must have been COLD! lol! Yes! But I'd LIKE to think he did it for me. We also ran into some gnarly surface conditions on part of the boardwalk.